"It's a testament to Rafle's skill as a director that even though we [...] know that the characters survived, THE INVISIBLES keeps you on the edge of your seat. " 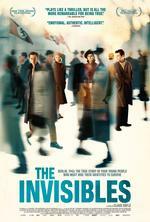 "A film like THE INVISIBLES is part of bearing 'precise witness.' We clearly need reminders, and constant ones, of the end result of 'otherizing' an entire group of people."